With ultramodern production facilities and high manufacturing set-ups help us to make optimum quality storage lockers. We manufacture and export various kinds of lockers like storage lockers, industrial lockers, and garment lockers as per latest market trend. We provide our lockers for the application in schools, Gyms, factories, swimming pools, health clubs, and recreation clubs etcetera. Our lockers are also preferred at various government departments, sports centers, mega stores and many more. 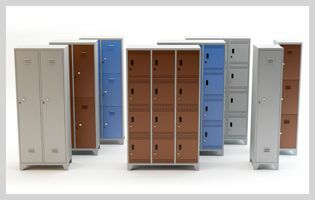 Our lockers are preferred due to their material of construction and long lasting performances. We earn repeat business with appreciation of our lockers. It is an ideal storage solution for the different requirements. We make use of the finest quality of steel and provide 16/18/20 gauge full height door with heavy duty hinge and stiffeners. The garment lockers and industrial lockers are provided with ventilation louvers located at top and bottom of the door to allow circulation of air in the lockers. We pay attention on customized inquiries. We provide lockers for specific size, shape and configuration.